"Gardening is how I relax. It's another form of creating and playing with colors." Creating an indoor herb garden is quite an easy task, as herbs are inexpensive, easy to maintain and undemanding. An indoor herb garden can serve as an introductory course for any beginner to the art of hydroponics gardening. 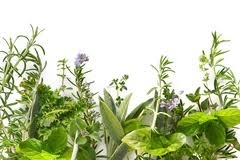 Depending on their use, herbs can be classified into culinary herbs, medicinal herbs and aromatic herbs. Culinary herbs include basil, rosemary, parsley and oregano. These herbs are used to add spice and flavor to food. Medicinal herbs include plants like echinacea, valerian, hypericum, and gingko, which are widely used in medicinal preparations. Oils from plants like lavender, rose, mint and basil are used for aromatherapies. Most of these plants are not suitable for an indoor herb garden as it is difficult to extract the medicinal parts of the plant. Ornamental herbs are those that are grown to enhance the beauty of homes. You can start with herbs like oregano, rosemary, garlic chives, mint and thyme. You can either buy baby plants at a garden center or can use stem cuttings. You can also start an indoor herb garden from the seed level. Heavy clay or terra cotta pots are preferred as these pots facilitate good circulation of air and water. You can have a beautiful indoor herb garden if you follow certain tips. Soilless mixtures of vermiculite, peat and perlite ensures proper growth of seeds and seedlings. Keeping pots in the southern or western window ensures proper sunlight and air. Pots should be kept in shady regions during summers. The growth medium should be moist but not wet. Humidity around indoor plants can be increased if they are grouped together. Or use a mister as you talk to your babies. And let there be light. Lots and lots of light. 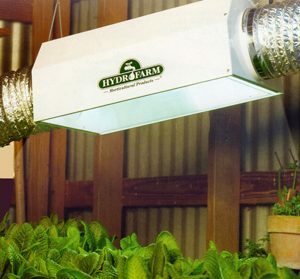 But... accumulated heat from the lamp can be a huge detriment to a hydroponic garden; possibly burning leaves, and without proper ventilation, contributing to the formation of fungus. The solution is to maximize your light radius by adequately distributing your light. Eliminating heat is actually secondary to the redirection of otherwise useless light. Think of using a reflector as supercharging and economizing your grow system. Reflectors come in many shapes, sizes and models. No matter the size of your growing space or your budget, you can find the right solution for your garden. The finish of the reflector determines the maximum possible percentage of redirected light. The whiter and brighter the finish the better. Titanium Oxide provides a high quality sheen that will last for a couple decades without any noticeable loss of quality, as long as you keep it clean. The ‘Sunray’ reflector is possibly the most economical version of the reflector, both in cost and design. It is merely a small sheet of aluminum with 2 bends, lending it the appearance of an upside down trough. 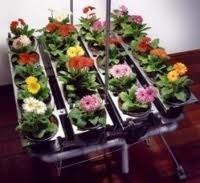 This form of reflector is more than adequate with a single bulb over a flow table, or small rectangular grow area. Other simple variations include the "wing-type" reflector, as shown below. The “Flat” or "cone" reflector is a circular sheet of metal, with one thin pie-slice shape removed from it. Joining the remaining sides of the pie turn the reflector into a very gradual cone. This reflector is best used in a multi-bulb environment or larger garden, as it diffuses light over a larger radius, rather than concentrating it. Taking the “Flat” reflector, and improving on its simplistic design is the “Parabolic” reflector. The parabolic also is cone-shaped in design, but manufactured by assembling trapezoid shaped pieces of aluminum. Its design ‘curves’ below the bottom of the actual bulb itself, capturing the light and redistributing it. It is extremely efficient at reflecting moderate light over a large area. 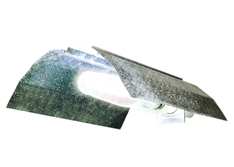 “Natural Convection-Vented” reflectors share their basic design with the “Sunray”, however, their ends are completely contained. Louvers are built into these reflectors to allow heat to escape upward, instead of becoming trapped close to the bulb. Its highly concentrated direction of light makes this a good choice for a small, compact garden, or where available space is a concern. “Mechanically Vented” reflectors are the "Cadillac" of the reflector world. Instead of relying on natural convection to dissipate heat from around the bulb, ducting, fans and ventilation force the heat out of your grow area. These models are completely enclosed, with a base of tempered glass. This aggressive removal of accumulated heat allows these reflectors to be positioned much closer to the garden itself, resulting in much stronger, more concentrated light. Below is a vented lamp with ductwork in place. If possible, do a little research before making your final decision. Keep the size of your garden in mind, and visit your local hydroponics store. Chances are, they will have demonstration gardens utilizing a couple of the different reflectors mentioned here. Ask to use a light meter, should they have one on hand, and check the levels for yourself. Whichever option provides the best light for the best price will be your best bet. Read more about high output T5 fluorescent lamps here . There is also a link to order one on that page if you would like.